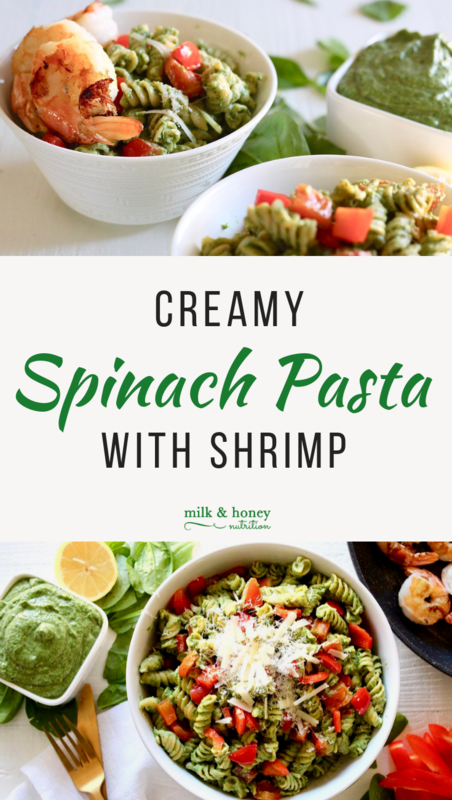 This recipe for Creamy Spinach Pasta with Shrimp (Gluten Free) was written and developed by Amanda Schroeder, our dietetic intern this semester. The sauce for this recipe is so creamy and perfect for everything from pasta to potatoes. You can serve this dish with shrimp as we do here, or have it on it’s own to keep it a vegetarian friendly meal! Cook pasta using instructions on the package. Save about ½ cup of pasta water. Using a medium pan, sauté onion and garlic in 1 Tbsp olive oil on medium heat until onions become soft/clear, about 10-12 min. Add spinach and cover, reducing to medium low heat. Allow to cook until all spinach is wilted, about 5 minutes. Transfer cooked mixture to a blender and set aside. Using the same medium pan, sauté chopped bell peppers in 1 Tbsp olive oil on medium-low heat for about 5-7 minutes. While peppers are cooking, add avocado, yogurt, lemon juice, parmesan, cayenne pepper, black pepper, and salt to the blender. Blend until smooth. Add sauce and cooked peppers to the cooked pasta and stir, adding pasta water 1 Tbsp at a time if sauce seems too thick. Cook the shrimp as desired. I like to pan fry mine on the stove with butter, about 5-6 minutes per side over medium-high heat. Serve with extra parmesan on top, if desired.